It’s safe to say that the future is “smart.” We have smart watches, smart phones, and now we are soon going to have smart fabrics. While this new technology will not permit you to send tweets through your clothes, it can detect an impressive range of pressure and motion. This is all possible through a carbon nanotube coating. A team of scientists from the University of Delaware, led by associate professor Erik Thostenson, are responsible for the development of this new material. At the base of the material are “regular” fabrics including cotton, nylon, polyester, or wool. The nanotube coating, which is about “0.25 to 0.75 percent as thick as a sheet of paper,” is then bonded to the surface of the fabric. This coating is ideal because it is lightweight, flexible, and inexpensive. The coating consists of carbon nanotubes, which are made of “rolled-up sheets of graphene, which is itself a one-atom-thick sheet of linked carbon atoms.” The electrically conductive nature of them makes it possible for electrical currents to run through the coating. This is how the coating is able to detect motion and pressure. 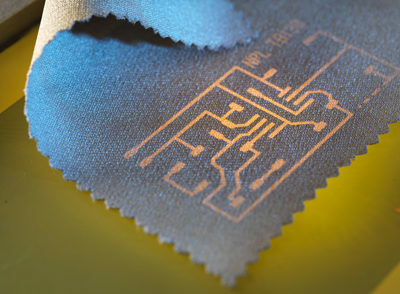 The team at the University of Delaware have started researching the applications for this smart fabric technology. So far, it looks like it could serve a useful purpose in the medical industry. The team of scientists has developed pressure-sensing shoe insoles, which could track the progress of someone recovering from a foot injury or even prevent injuries for the wearer. The scientists have found that these shoe insoles are capable of providing pressure data comparable to a high-cost force plate device. Other uses for this fabric could include “monitoring post-surgical recovery and assessing pediatric movement disorders while children are in their homes.” People wearing this fabric during recovery would be taking trips to the clinic less frequently as a result.